Skydiver and stuntman Luke Aikins has made over 18,000 parachute jumps, but the jump he is planning to make today is one that will be most memorable. Aikins is scheduled to jump out of a plane from 25,000 feet without a parachute or a wingsuit. 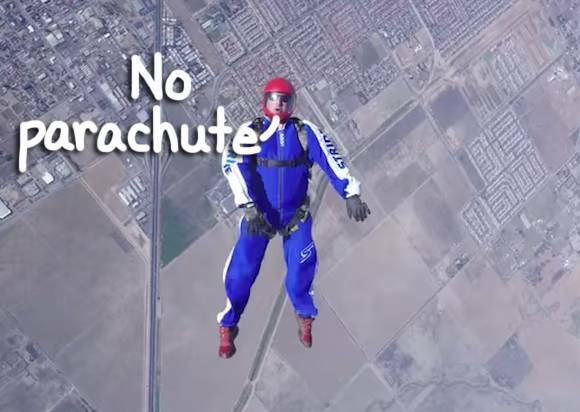 He is attempting to be the first person to jump out of a plane and land safely in a net. The net is 20 stories high and is about one-third the size of a football field. The Fox network will broadcast the jump live at 8:00pm EDT. As dangerous as this jump is, it pales in comparison to the danger of going into eternity without Jesus. He plainly says that he is the only way to be saved and to be with God in eternity. To leave this life without him is certain death. This entry was posted in Christian Living, Communion Meditations, Current Events and tagged daredevil, illustration, John 14:6, jumping out of a plane, Luke Aikins, risk, stuntman without parachute. Bookmark the permalink.